We’d love your help. Let us know what’s wrong with this preview of Rising Above the Scars by Johnnetta McSwain. 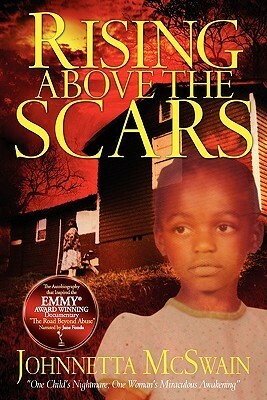 Rising Above the Scars is the true account of Johnnetta McSwains triumphant life story. Viciously abused as a child, she rose above every stereotype and beat all odds, narrowly escaping poverty, self destruction, prison, drug abuse, and death. To ask other readers questions about Rising Above the Scars, please sign up. I am a Domestic Violence Resident Advocate and read this book after attending a meeting that Ms. Johnetta McSwain put on. What an amazing story! Her book absolutely captivated me, shifting me from tears, to sobs, to out rite fits of anger, her story is potent. I have since then given this book to my ladies at the shelter and am looking forward to hearing their takes on it. Additional to the story, this book is full of information on breaking negative life cycles as well as groups and organizatio I am a Domestic Violence Resident Advocate and read this book after attending a meeting that Ms. Johnetta McSwain put on. What an amazing story! Her book absolutely captivated me, shifting me from tears, to sobs, to out rite fits of anger, her story is potent. I have since then given this book to my ladies at the shelter and am looking forward to hearing their takes on it. Additional to the story, this book is full of information on breaking negative life cycles as well as groups and organizations that are dedicated to helping others recover and move on it their lives. Excellent autobiography! Johnnette shares her very moving and inspiring story that makes you want to make a difference. Everyone of us has control over our destiny. Thank you Johnnette for sharing and thanks for the signed copy! "Failure is not an option"
If Johnnetta McSwain can do it, so can you!